The global zinc–air batteries market was valued at US$ 1,414.45 Mn in 2017 and is anticipated to expand at a CAGR of 8.2% from 2018 to 2026, according to a new report titled ‘Zinc–Air Batteries Market: Global Industry Analysis, Size, Share, Growth Trends, and Forecast, 2018–2026,’ published by Transparency Market Research (TMR). The global zinc–air batteries market is driven by rise in the demand for use of these batteries in hearing aids in the medical industry. Europe accounts for a major share of the global zinc–air batteries market. Increase in the rate of incidence of hearing disorders among geriatric population, typically in the U.S. and Europe, has boosted sales of hearing devices. Rise in the rate of incidence of hearing disabilities among newborns is a major concern in the global health care sector. The need for improved hearing aids is gaining momentum, which is driving the demand for zinc–air batteries. Ability of zinc–air batteries of providing a steady supply of power, by ensuring proper functioning of hearing aids, is likely to augment the demand for zinc–air batteries for use in hearing aids in the next few years. Hearing aids with zinc–air batteries can function under various temperature conditions. All these factors along with cost effectiveness are likely to propel the demand for zinc–air batteries for use in hearing aids in the near future. Demand for battery systems for use in traffic signaling systems has increased exponentially in the last few years. Zinc–air batteries are used in LED traffic lights, traffic signs, temporary traffic signs, and various warning signals. Features of zinc–air batteries such as quick startup, stable voltage, light weight, and low self-discharge are anticipated to offer lucrative growth opportunities to the global zinc–air batteries market during the forecast period. Demand for zinc–air batteries is high in the railways industry, owing to extreme resistance to vibrations that these batteries provide. Improper functioning of traffic signals led by reduced shelf life of battery backup can lead to accidents. Zinc–air batteries can function well in such conditions owing to their long shelf life. Zinc–air batteries are safe to handle, without any risk of leakage on fixed or moving installations. Rechargeable zinc–air batteries are anticipated to be significantly applied in consumer devices, automobile starters, light vehicles (motorized wheel chairs, electric forklifts, electric vehicles, etc. ), portable consumer devices, tools, and uninterruptible power supplies. Rechargeable batteries offer a more reliable, ecological, and sustainable replacement for non-rechargeable batteries. 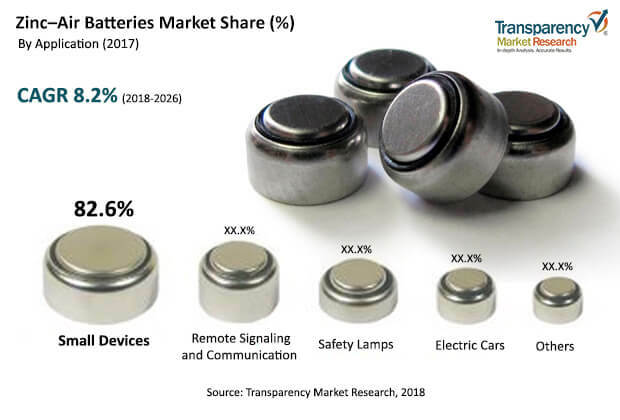 Increase in the demand for consumer devices, portable devices (such as music players, digital cameras, camera phones, and portable computing devices), automobiles, and bio-based vehicles is likely to drive the zinc–air batteries market from 2018 to 2026. Presence of traces of mercury in zinc–air batteries can cause health hazards. Mercury can leak as the zinc–air battery casing disintegrates. A large number of countries have mandated that zinc–air batteries be mercury-free. This is attributable to risk of mercury poisoning from accidentally ingested batteries. High-performance electrodes are necessary to catalyze the oxygen-reducing reaction during discharge and oxygen production during recharge. In zinc–air batteries, these two reactions are sluggish. However, performance of the anode can be enhanced by using zinc nanoparticles. Among applications, the small devices segment (including watches, hearing aids, pagers, etc.) dominates the global zinc–air batteries market. Light weight is a major factor that drives the demand for zinc–air batteries in the small devices sector. Other advantages offered by zinc–air batteries used in small devices include high energy density, cost-effectiveness, constant voltage rate over a relatively long time, and proven technology. Among regions, Europe accounted for a major share of the global zinc–air batteries market in 2017. According to a report by the European Association of Hearing Aid Professionals, more than 80 million adults in Europe were suffering from hearing impairment in 2015. Growth of elderly population and introduction of appealing technologies in Europe are boosting the demand for zinc–air batteries in the region. Government initiatives to replace the existing railway signaling systems, typically in Denmark and Switzerland, are boosting the market in Europe. Key players profiled in the report include Berkshire Hathaway Inc., Spectrum Brands Holdings, Inc., Energizer Holdings, and Panasonic Corporation. These players are forward integrated and they account for a major share of the global zinc–air batteries market, in terms of production capacity. Brand promotions and launch of new products are likely to increase sales of zinc–air batteries in the near future. Market leaders are striving to adopt measures such as strategic pricing and product improvement to gain market share.